Police in Athens fired tear gas at crowds of protesters who had gathered outside parliament on Thursday to express anger over the proposed name change of the Former Yugoslav Republic of Macedonia to the Republic of North Macedonia. 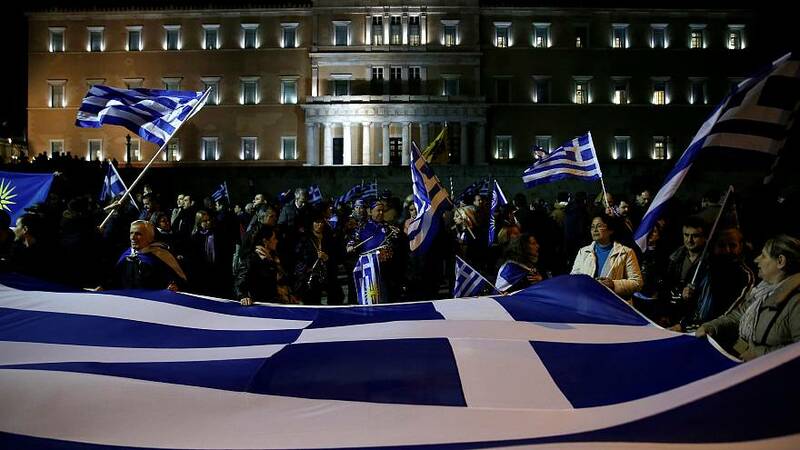 Protesters chanted "Long live Macedonia, long live Greece! ", referring to the Greek province of Macedonia. There were also protests in the northern Greek city of Thessaloniki. The Greek parliament on Thursday delayed the expected approval of the UN-brokered deal between Athens and Skopje changing the latter's name to the Republic of North Macedonia by a day due to an increased number of lawmakers who wanted to have a say over the deal. If the deal goes through it could pave the way for FYR Macedonia to join the EU and NATO, something Greece has previously blocked because of the name dispute. Protesters chanted "traitors" as lawmakers debated the ratification of the agreement. They were seen hurling petrol bombs, stones, flares and firecrackers at police guarding the parliament, according to Reuters. "We feel betrayed," Zografos Stathakopoulos, a 47-year-old protester, told Reuters. "Most Greeks don't want this deal, but politicians are betraying us." A poll this week in the local Proto Thema newspaper showed 66% of respondents in Greece are against the deal. Greeks have long opposed the Balkan country's name, saying it implies a territorial claim to the northern Greek region of Macedonia and has taken issue with FYR Macedonia's claims to certain ancient symbols and figures. Greece's Macedonia region was also home to the ancient Greek-speaking kingdom made famous by Alexander the Great. Born in what is today Pella, Greece in 356 BC, Alexander the Great succeeded his father Philip II of Macedon to the throne at the age of 20. Through an unprecedented military campaign, Alexander created one of the largest empires of the ancient world by the age of 30, stretching from Greece to northwestern India. A massive statue made in the likeness of Alexander the Great, towers in the central square of FYR Macedonia's capital Skopje and has remained a point of contention between the neighbouring countries. Lawmakers in both Athens and Skopje have failed to resolve the issue for the last 28 years.